You know there's some strange cosmic forces at work when a gabacho boy such as myself gets highlighted in a Latino lifestyle magazine. But, dear readers, it is all true. The April 2007 issue of Tu Ciudad Los Angeles is this year's "Best of Orange County (Latino-Style)" edition, which might start to rival Sports Illustrated's annual Swimsuit Issue in popularity. I was contacted by their Editor-in-Chief a while back asking me which OC restaurant had the best guacamole and which place had the best margaritas. I had to say I don't even drink (I have since had virgin margaritas at Gabbi's and Taco Rosa) and that I knew it sounded silly but I really and truly felt El Torito Grill had the best guacamole, and I mentioned the guacamole at Olamendi's as a runner up. Since I've never stayed at a hotel in Laguna Beach I've never been exposed to what Ciudad ended up calling the best guacamole in OC. Read the issue to find out where it's at . . . then book a room and try some of Orange County's best guacamole. Ciudad points out many of the places we have mentioned here, including Taleo (which gets special mention and its own big article; also, stay tuned for a special post coming here soon highlighting some of Taleo's new menu items), Taco Rosa/Taco Mesa, Kantina, and La Sirena Grill. They also pointed out a couple Mexican eateries I still need to make it to and had a big article about O.C. Weekly's Gustavo Arellano. The issue should be on newsstands now at Ralphs and Vons supermarkets throughout OC, plus selected Borders and Barnes & Noble booksellers. Look for me somewhere between page 30 and page 70. Sorry, I'm not going to scan it in and post it here. Be old-fashioned and buy a copy. 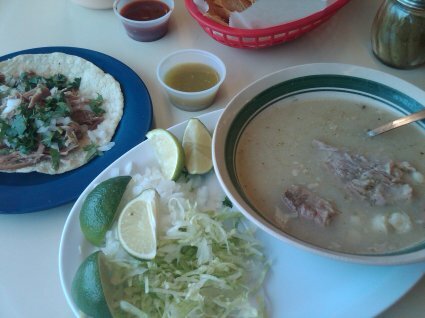 READ THIS FIRST: Click here to read ALL our extensive coverage of both Taco Rosa locations. This is the link to follow since this entry you are on now about Taco Rosa's second location "opening soon" has been outdated (and has no pictures of their food). Just found out that Taco Rosa's second location is solidly on track for an official opening this coming Monday, March 26. I drove over after work earlier today and pulled into a parking spot and tried to ascertain if they were open for business or not. On one hand, there were ladders against some of the walls, people sweeping up outside, and other hints that they were in final touchup stage. On the other hand, while peering in through the windows (the best I could from my parked car) I thought I saw people inside cooking up food. I didn't want to presume to be allowed to walk in if all they were doing was finishing up construction but I also didn't want to drive away if it turned out they were really serving food. As I sat there I noticed there was a married couple parked a couple spaces away from me apparently in the same dilemma as myself. Finally the wife got out, walked up to Taco Rosa's entrance, talked with somebody there, then waved her husband in. That was my signal to give it a try myself. As I was walking up I asked one of the workers outside if it was open for business and he told me it was training day and asked if I counted as "friends or family." I said, "Well, there's several employees at the other location that recognize me every time I go." He said, "Okay, let's see if we can get you in." And we walked in and nobody had a problem with me being there. I was seated promptly and noticed there were about 20 other people there to enjoy dinner. I had the funny feeling that a couple of them were also food critic types. I was treated with the usual complementary botana, a tostadita this time with escabeche on the side, which was served in a nice, sturdy wireframe-type basket instead of the woven baskets used at the first location. 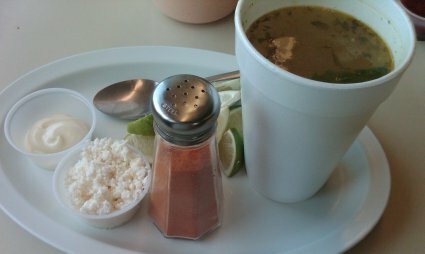 I was also treated to some guacamole and red corn chips, some shrimp-stuffed jalapenos, and a bowl of lobster bisque, Taco Rosa's house soup. I of course also ordered some aguas frescas, mango this time. At this location the servers walk around with pitchers of aguas frescas, ready to top off anyone's glass. They also had cantaloupe aguas frescas on hand tonight. For an entree I had the steak and lobster tail recommended to me by my waiter. This was served with potato cakes, acorn squash puree in a red pepper half, lemon, garlic butter, and fresh-made tortillas. Nothing like being able to make your own lobster tacos. While eating my main course I noticed that some of the Calderon friends and family there had desserts that were the same as at the first location but presented even more professionally. When asked what I would like for dessert I hesitantly asked my server if I could get a flan with two chocolate-covered strawberries (on the menu they are two separate desserts). He replied, "Anything you want. You're the boss tonight." If I'd been able to take a picture of it you could see how appetizing it looked. It was the perfect end to the perfect meal. Only thing is, after I was done eating it brought back all the memories of my first few times eating at Taco Rosa when I didn't know how easy it was to get extremely, uncomfortably, full before I learned how to order my meals there in a way that filled me up just right without any lingering feelings of gluttony-triggered regret. If you've never been to Taco Rosa before just trust me that you should order a little less food than you think you need. Go three times, trying something completely different each time, until you understand their menu and portion size better. I wish I could show pictures of the interior but you'll have to imagine a version of the other location with some of the same design elements presented in an all-new way. From glancing around it looks like they will have a little more indoor seating and a little less outside seating. One big improvement is that the chairs and tables here allow a little more room for your legs under the table. When they open on Monday they will just be open for dinner for the first few days, although the exact number of dinner-only days has yet to be determined. Then they will add lunch (note: it has since been confirmed that they will open for lunch beginning Wednesday, March 28) and about a week after that they will also be open for breakfast. A waitress there tonight confirmed that they will then be offering breakfast every day. I was asked not to take pictures during this visit. I don't blame them since there were still some final touches needed and it was understood that this was not the official opening. Not being able to take pictures this time meant that I was forced back to the early days of this blog when I was more verbose and descriptive and my reviews had either no photos or ones that were poor quality. For plenty of photographic examples of their food just click on the "taco rosa" label at the end of this entry. You will see that they got better as time went on. Taco Rosa: Spanish for "really full bellies and really satisfied taste buds." quesadillas and these deep fried shrimp things. and the service is impeccable. And the aguas refrescas are bottomless. But, unfortunately, my bladder ain't. Read the Orange County Register's March 29th article on the new Taco Rosa. Still not open yet. Looks like they might still have another couple days to go but the green fence visually blocking off the construction site from public view has been removed and it looks like this new location will have very nice decor. Just drove by the site on my lunch break and I'm making an educated guess here but I don't think they are quite ready to actually open today. I could be wrong though. Some people may wonder why I'm covering this so much. The answer is that my site statistics show that plenty of people are searching for information on this new Taco Rosa location and no other site on the Internet is covering it. Received an e-mail directly from Taco Rosa stating that they plan to open on March 19. For the first week they will be open for dinner only. During the second week they will be open for lunch and dinner. After the third week they will be open for breakfast, lunch, and dinner. Don't know though if that means they will be open for breakfast every day. "This Site is Under Construction"
Got an e-mail from somebody at the Irvine Company earlier today stating that "Taco Rosa [on the Irvine side of the Tustin Marketplace] should open sometime near the end of March." Then went to Taco Mesa in Costa Mesa for lunch (look for review soon) and one of the employees there said the best he knows right now is that it will open on March 19. Expect more information to be posted here as the date arrives. El Rincon Chilango has to be the most colorful restaurant I have ever seen. You cannot miss it driving down 17th St. Stripes and every color in the rainbow. But what stopped me dead in my tracks was a sign advertising "Tlacoyos." This has been the first time I have ever seen these on a menu. I had first read about them in A Kennedy book - I forget which. Apparently it is a specialty of Mexico City and considered an Antojito Chilango. It is a long oval shaped masa snack that is cooked with a filling inside and a salsa is poured over with some salty cheese and cilantro and minced onion. I had never had flor de calabaza or squash blossom before (next time Im trying the haba) so I ordered that. There is an indoor seating area on one half side of the restaurant with table service. Every table was filled with families eating together on Sunday - eyes affixed to TV Azteca playing up above. After a bit of a wait, sipping on my horchata, the plate arrived. It's a pretty unique dish. The masa was made from Maseca but it was crisp and warm. The salsa verde was one of the best I have had - extremely bright and flavorful, interspersed with salty queso fresco. The flor was likely from a can - just ok. This may be one of the only Mexico City style restaurants in the area and has some unique dishes I plan to work my way through, esp. tacos de canasta and the borrego the guy next to me had. Los Cabos has been in Orange for about 15 years now, and was one of the first to fill the niche for Mexican Seafood "Mariscos" in the area. 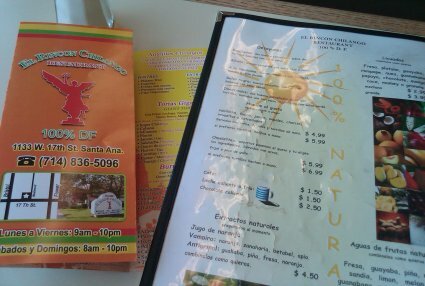 The menu is moderately priced, and offers a wide range of items from the usual tacos, enchilladas, rellenos and carnitas and they do them all well. BUT - Go for the fish! Your meal starts out with excellent chips and salsa. I like the darker (mole?) salsa. I ordered the Filete Tropical, which is a white fish cooked in a mango salsa. It was scrumptious, and cooked just right. I have had the Veracruzana and that is good too. It was served with rice and beans. I would say their rice is below average. Very bland and little flavor. The beans are better than average. Mrs. Lambrusco really ordered something good. She ordered a "small" bowl Siete Mares soup, which goes for $11.95. It was HUGE, and was heaped with crab legs, scallops, shrimp, white fish, carrots and celery. She held the octopus - she doesn't like it! This soup has got to be the biggest bargain in town. I shudder to think what the large size is like at $16.95 - I think. She also had a fish taco a la carte, which was very big on a flour tortilla. The atmosphere is nothing to rave about at Los Cabos. It is in a strip mall, and is one step up from the hole-in-the-wall type places. BUT - go for the fish, not the decor! A soccer game is usually playing on the TV in the dining room on Sundays. The service was fast and friendly, and to make it even better, I used the $9 off coupon in the Orange County Entertainment Book. I know Christian will be disappointed, but we did not have dessert. Thanks, Chaz. Looking forward to more reviews from you. To our other readers: we are always open to guest review submissions. BTW, I noticed that Elmer Dills likes Los Cabos too. 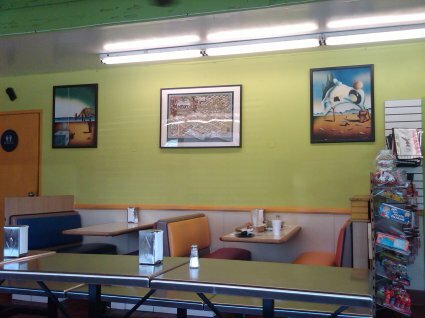 Here's a few pictures from one of my favorite places: Blue Agave Southwest Grill in Yorba Linda. I've only been three times; each visit was a result of visiting my friends James and Lori out in Anaheim. It's billed as a "Southwestern Grill," and not "Mexican," per se, but when their menu is filled with items such as tortilla soup, quesadillas, flautas, guacamole, taquitos, mole enchiladas, pozole soup, tostadas, etc., then I feel safe reviewing it here. James ordered the Chicken Pozole Soup, unique in that it's the only pozole I know of served in tomatillo broth. Rounded out with chicken and hominy and served with sides of peppers, onions, cilantro, and cotija cheese I already know this is what I'm going to order the next time I go. Having not had mole anywhere in a while I jumped on ordering the Arizona Chicken Mole Enchiladas: "Chicken rolled up in tortillas and served in our special mole sauce of chile anchos, tomatoes and plantain. A spicy and sweet favorite served with Texas beans and rice." This mole, rich, full-bodied and spicy, rivals that of Javier's, Taleo's, and Taco Rosa's. As we walked away James remarked, "I wonder if they have anything there that's not good." Time for another "roundup" entry where I post info that doesn't fit neatly into a proper restaurant review. Mexican restaurants I have already reviewed and have visited since the last roundup entry for non-review purposes include: Tortilla Jo's Taqueria (the walkup window at Tortilla Jo's at Downtown Disney, Charo Chicken, Taco Rosa, El Pollo Loco (which is bringing back their black beans today), Taleo (look for an entry featuring some of their new menu items soon), Normita's Surf City Tacos, Baja Sharkeez, Blue Agave (although I might do a photo post of this particular visit), and Taco Mesa in Ladera Ranch. Mexican restaurants I haven't reviewed yet (but will review sometime) that I've visited for non-review purposes (just old-fashioned eating) since the last roundup entry include: Super Antojitos and Wahoo's (yes, the Wahoo's Non-Review Curse has struck again).